New Hampshire’s quiet demeanor doesn’t attract a lot of attention, but for those who have visited this tiny state sandwiched between Vermont and Maine, they enjoy the quaint towns and striking vistas. One of the best ways to explore New England is by renting a cottage in New Hampshire. The Granite State places you in the middle of it all. Guests staying in New Hampshire rentals get a unique outlook of New Hampshire depending on where they choose to stay. With all the lovely rentals New Hampshire offers to visitors, guests will have a hard time deciding whether to stay in one of the gorgeous Hampton Beach rentals along the seacoast, a Lake Winnipesaukee rental, or one of the ski rentals in Jackson NH. The White Mountains is the “hot” place to go for ski rental cabins in New Hampshire. The White Mountains is also a great hiking location during the summer. Lakes Region offers beautiful New Hampshire lakefront rentals including Lake Winnipesaukee summer rentals. Monadnock Region provides a traditional New England feel. Find a Keene NH rental property to step back in time. Seacoast includes Hampton Beach rentals and other stunning lodging in New Hampshire. Of all the rentals New Hampshire has to offer, Hampton Beach rentals remain a constant favorite. Dartmouth and Lake Sunapee Region is a great location for guests seeking New Hampshire lakefront rentals. 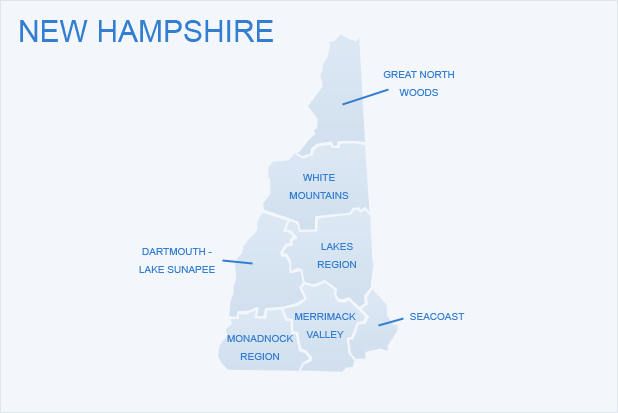 The best way to see New Hampshire (if not walking the delightful trails) is by motorcycle or car, and interestingly, New Hampshire is the only state in the U.S. that does not require adults to wear seat belts. The state is small and the roads picturesque, dotted with covered bridges. The back country roads are also a draw for bikers who enjoy the challenge of the inclines and the beauty of the winding ribbons of road. For those who love adventure, the drive up to the nearly 7,000-feet-high Mount Washington is breath-taking, and unnerving in spots, but worth the trip and the view. 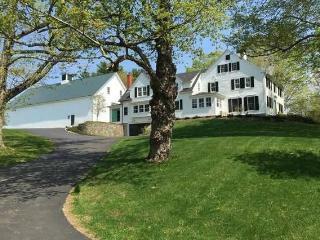 Canterbury Shaker Village just north of Concord, New Hampshire rentals. Visitors spend hours touring the original buildings (dating back to the 1780s). Portsmouth, New Hampshire’s only seaport. While in Portsmouth, stop by the Strawberry Banke Museum (open from late April through October). This living “museum” sits on ten acres. Hampton beach rentals are only 15 miles south of Portsmouth. With lakes galore, many rentals New Hampshire has are lakefront properties. Water sports are a big draw to guests staying in New Hampshire lakefront rentals. Guests staying in New Hampshire lake rentals often kayak and canoe. 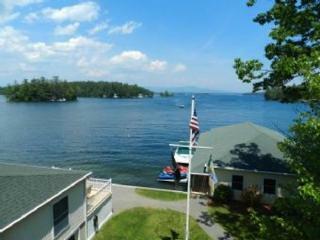 Guests staying in Lake Winnipesaukee rentals find swimming and fishing delightful activities during the summer. During the winter, visitors stay in New Hampshire vacation rentals in the White Mountain Region to enjoy fantastic winter sports afforded there. Look into rentals in Jackson NH if you like skiing. With their Lakes Region, New Hampshire offers guests seeking New Hampshire Lake rentals many choices. Lake Winnipesaukee rentals are popular with visitors. Lake Winnipesaukee provides 72 square miles of water and includes over 200 islands. If you find all of the Lake Winnipesaukee vacation rentals booked, keep looking. With over 250 other lakes in the Lakes Region, you can still find the perfect New Hampshire lake rental waiting for you. 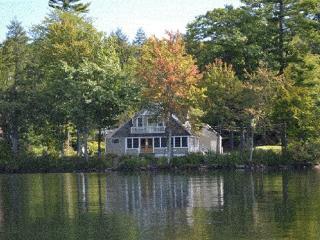 New Hampshire Lakefront rentals with scenic views and lake frontage are available. In the summer, New Hampshire lake rentals provide quick and easy lake access for boats. Some New Hampshire lakefront rentals come with sandy “beaches” on which to relax. New Hampshire Lakefront rentals are also super for winter sports including ice fishing, snowmobiling and cross-country skiing. 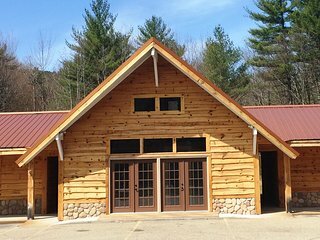 New Hampshire Lakefront rentals include affordable cabins, New Hampshire lake rentals with acres of privacy, and New Hampshire Lake rentals just yards away from the lakeshore. With options abounding, a great number of Lake Winnipesaukee rental guests return every year. Hop on board the Conway Scenic Railroad in North Conway Village, located on the southeastern part of the White Mountains Region. Experience a nostalgic rail trip. Drive up Mount Washington in the White Mountain Region. Mount Washington is the highest mountain peak in New England. Mount Washington is also known as one of the windiest spots in the world! Go on a “covered bridge” driving tour. New Hampshire has over 50 covered bridges. Roofs were built to help protect the bridges from water damage. Guests staying in New Hampshire rentals enjoy shopping because New Hampshire does not have a sales tax. New Hampshire vacation rental guests purchase locally grown and pressed apple cider or maple syrup. Outlet malls and antique stores are another main draw for shoppers. No matter if you stay in one of the fun Hampton NH summer rentals or find lodging in New Hampshire in one of the striking Lake Winnipesaukee summer rentals or New Hampshire White Mountain rentals, you can still savor delicious New Hampshire cuisine. Local dishes include New England clam chowder, New England corn chowder, and Portland orange cake. When on the seacoast, leave enough room for tasty seafood and fish dishes in local restaurants. Guests often reserve Lake Winnipesaukee rentals and other New Hampshire lakefront rentals in the summer to avoid the hotter climate found further south. Guests staying in seacoast New Hampshire beach rentals delight in summer lows in the 50s and highs in the 70s. Guests staying in New Hampshire White Mountain rentals in the winter do not mind that lows dip in the single digits and highs usually stay in the 20s. Guests staying in vacation rentals New Hampshire style have no trouble keeping warm outside with all the invigorating winter sports available. 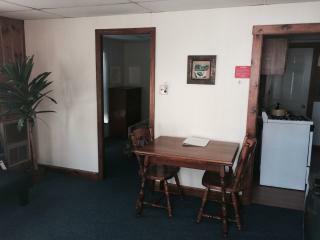 A good number of rentals in Jackson NH also offer warm fireplaces and inviting hot tubs. The climate in New Hampshire’s White Mountains varies slightly from the rest of the state because of its elevation. It’s cooler and receives more snow. For the rest of the state, summers are pleasant with temps averaging in the 70s to 80s. The summer evenings cool off to a delicious 50-60 degrees F, making a light jacket a good idea. Visitors who stay in cottages in New Hampshire during the summer note that few have air conditioning, nor do they need it. Winters are cold with several feet of snow. This is great for New Hampshire’s ski industry and those who love snowboarding, cross-country skiing, snowmobiling, and snowshoeing. New Hampshire is home to several large events throughout the year, in addition to the informal fall foliage tours. The New Hampshire Motor Speedway draws a crowd during race days. Laconia Motorcycle Week occurs every June for nine days (ends on Father’s Day) at Weirs Beach. The event draws over 100,000 people each year. New Hampshire is also the home of over 80 farmer’s markets. These agricultural oases are wonderful spots to sample local honey, artisan cheeses, and fresh vegetables. The New England Brewfest is held at the end of June each year in Lincoln. New Hampshire offers the quintessential charming New England experience, rich in history and filled with beautiful spots to enjoy the outdoors. Renting a cottage in New Hampshire provides the perfect home base to explore this state or those surrounding it. No matter what the season, you’ll enjoy this tiny gem and its magnificent granite outcroppings. 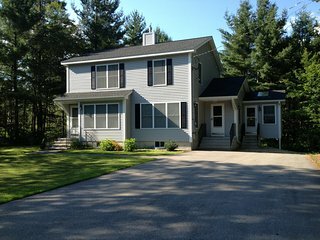 With all the wonderful rentals New Hampshire has to offer, guests staying in lodging in New Hampshire will easily be happy with their choice. See you in the Granite State!